Ask anyone from Cajun Country and they’ll tell you their favorite crawfish recipe. They’ll probably tell you the best way to prepare it too! My mom always said the best dishes start in a big Dutch oven (cast iron skillet). And, Mama knows best. 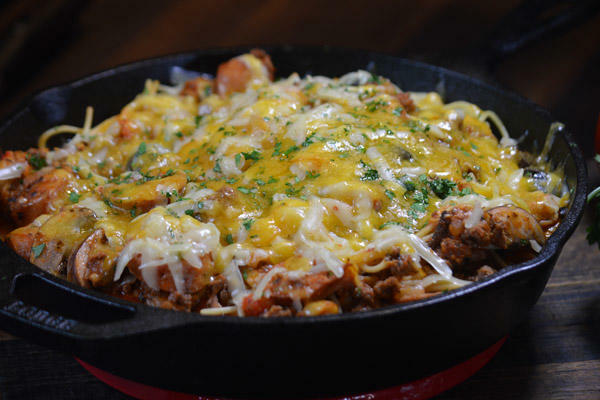 When Flip My Food, a cooking show that “flips” dishes into healthier versions, visited Creole Nature Trail Adventure Point back in October, they brought crawfish and cast iron together in one mouthwatering dish: Spicy Sausage & Crawfish Spaghetti Casserole. It’s got spicy, cheese, and of course, tender crawfish tails. In fact, several of the ingredients can be found in the interactive Cajun kitchen exhibit at Adventure Point where you can take a whiff of onions, garlic, butter, and spicy pepper. With all these flavors, this is a recipe both crawfish lovers and Mama would approve. In a large Dutch oven or cast iron skillet, over medium-high heat, add olive oil, onions, bell pepper, jalapenos and garlic. Let ingredients cook until caramelized. Add ground beef, sausage and crawfish.Cook meat until beef is no longer pink. Break up beef into crumbles, about 8-10 minutes. Drain off fat and stir in spaghetti sauce, bring to a boil. Reduce heat; simmer uncovered for 20 minutes. Season to taste; stir occasionally. Add cheese. Bake at about 350 degrees for 10 minutes or until cheeses have melted. Remove from oven and serve. Not in the mood to cook your own crawfish? No worries! There are several Southwest Louisiana restaurants who’d be happy to serve you. Click here for a full list.